You’d never know it from President Barack Obama or the mainstream media, but America is under attack from its ideological adversaries, says award-winning national security reporter Bill Gertz. 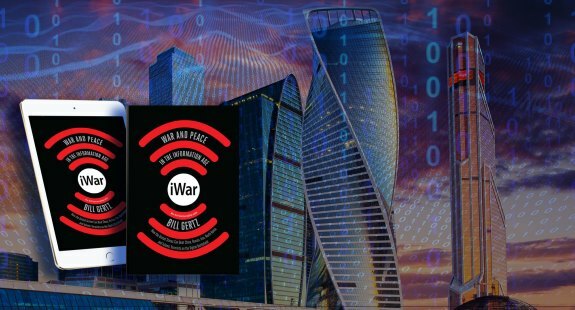 After writing a comprehensive review of Obama’s statecraft, “iWar: War and Peace in the Information Age,” Bill Gertz says ominously, “Americans are in the dark” about the threats we face. In an exclusive must see video interview with our friend Ginni Thomas, Gertz said, “Under the Obama Administration, we had three massive security failures and nothing was done to fix the problems,” citing Bradley Manning’s leak to Wikileaks, Edward Snowden leaks and former Secretary of State Hillary Clinton’s use of an unsecured server that caused serious damage. It was only when the election went against the Democrats that Obama decided to rattle Russian President Vladimir Putin’s cage by some public reaction and sanctions. As for the “Russian hacking” that lit up the intelligence community and the media lately, Gertz says Democrats are using the hacking narrative as a political ploy to undermine Trump before he takes office. The truth, Gertz says, is that the hacking of the Democratic National Committee really reveals a “massive counterintelligence failure” to keep the nation safe. And here’s what is the perhaps the most interesting point in Gertz’s book: It’s not Russian hacking that is our top cyberthreat. Yet American leaders remain lost in a Cold War political gambit that once saw China as covert ally against the Soviet Union. Today the Soviet Union is gone but China remains a nuclear-armed communist dictatorship on the march. From an information warfare stance, says Gertz, China today has emerged as one of the most powerful and capable threats facing the United States. By May 2016 American intelligence agencies had made a startling discovery: Chinese cyber-intelligence services had developed technology and network penetration skills allowing them to control the results of Internet searches conducted on Google’s world-famous search engine. By controlling one of the most significant Information Age technologies used in refining and searching the massive ocean of data on the internet, the Chinese are now able to control and influence what millions of users in China see when they search using Google. Thus, a search for the name Tiananmen—the main square in Beijing, where Chinese troops murdered unarmed prodemocracy protesters in June 1989—can be spoofed by Chinese information warriors into returning results in which the first several pages make no reference to the massacre. The breakthrough is similar to the kind of totalitarian control outlined in George Orwell’s novel Nineteen Eighty-Four with the creation of a fictional language called Newspeak, which was used to serve the total dominance of the state. Technically, what China did was a major breakthrough in search engine optimization—the art and science of making sites appear higher or lower in search listings. The feat requires a high degree of technical skill to pull off and would require learning the secret algorithms—self-contained, step-by-step computer search operations—used by Google. The intelligence suggests that Chinese cyberwarfare researchers had made a quantum leap in capability by actually gaining access to Google secrets and machines and adjusting the algorithms to make sure searches are produced according to Chinese information warfare goals. Those goals are to promote continued rule by the Communist Party of China and to attack and defeat China’s main enemy: the United States of America. Thus Chinese information warriors can continue the lies and deception that China poses no threat, is a peaceful country, does not seek to take over surrounding waterways, and does not abuse human rights, and that its large-scale military buildup is for purely defensive purposes. Gertz’s book reveals an array of foreign threats –including nuclear threats — actions, and aggressive hacking that have gone without response during Obama’s term in office. Also in “iWars,” Getz has a penetrating chapter on the left and how it has eroded the strength of America with an information warfare of false narratives, propaganda, political correctness and subversion. Asked by Thomas about Democrats’ “crocodile tears” regarding Russians trying to influence the election when leaked emails revealed George Soros manipulated elections in Europe and Obama’s team worked against Prime Minister Benjamin Netanyahu in Israel, Gertz believes false narratives are dominating American political culture. Retired army lieutenant general and former DIA director Michael Flynn, the incoming White House national security adviser, has criticized the failure to understand Information Age threats and respond to them forcefully. Submitted by antityrant on Mon, 01/16/2017 - 16:38. FBI Director Comey testified to Congress that the FBI was not given access to the DNC computers that were reportedly invaded by the Russian Government intelligence gathering operations. Nor did they gain access to John Podesta’s email server. Without examining the hardware and data systems, how did the intelligence agencies reach their conclusions about the Russian involvement? The FBI has the best forensic resources in the world for digging into criminal acts or data system invasions, and finding evidence. Anyone else is less reliable. So, what evidence did the intelligence agencies have, and who provided it? Obama deemed it sufficient to dramatically evict Russian Agents from the United States, and to impose some sanctions on Russian Government officials. Excluding the FBI makes it look more like a politicization operation than a counter intelligence operation. It makes more sense that a Democrat Party insider was interested in undermining the Clintonista machine’s hold on the Party. They thought that Trump could not beat Clinton in the Electoral College. So, the Sander’s supporters thought it was safe to elbow out some of Clinton’s crew that treated Sanders unfairly.